When will be America's Greatest Makers next episode air date? Is America's Greatest Makers renewed or cancelled? Where to countdown America's Greatest Makers air dates? Is America's Greatest Makers worth watching? This spring, tune in every week for a new reality TV challenge where teams of makers invent game-changing technology all for a chance at $1 million prize. Guest judge Massimo Banzi joins the panel as the remaining makers compete in the Make or Break rounds for $100,000 and a spot in the million dollar finale. Guest judge Shaquille joins the panel as the remaining makers compete in the Make or Break rounds for $100,000 and the final spot in the million dollar finale. The five finalist teams bring their refined devices to the panel one last time for the chance to win $1,000,000 and the title of America's Greatest Maker. The judges welcome Mike Rowe and Kenny Smith returns to the panel. 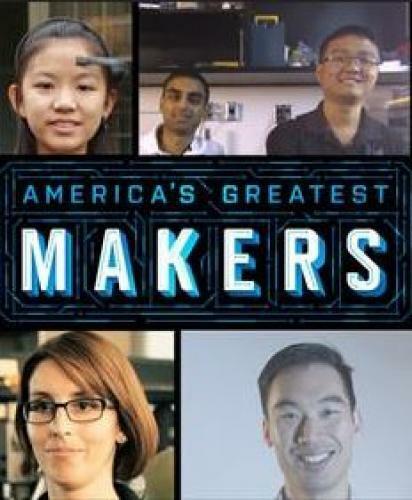 America's Greatest Makers next episode air date provides TVMaze for you. EpisoDate.com is your TV show guide to Countdown America's Greatest Makers Episode Air Dates and to stay in touch with America's Greatest Makers next episode Air Date and your others favorite TV Shows. Add the shows you like to a "Watchlist" and let the site take it from there.